I capture and edit in ScreenFlow. The editing is important. This is where you can remove typos and “dead air,” speed things up or slow things down, and generally get your clip polished to your taste. Previously I did this in Photoshop’s animation palette, which, in hindsight, was just plain insanity. Learn from my mistakes and use ScreenFlow’s editing tools. 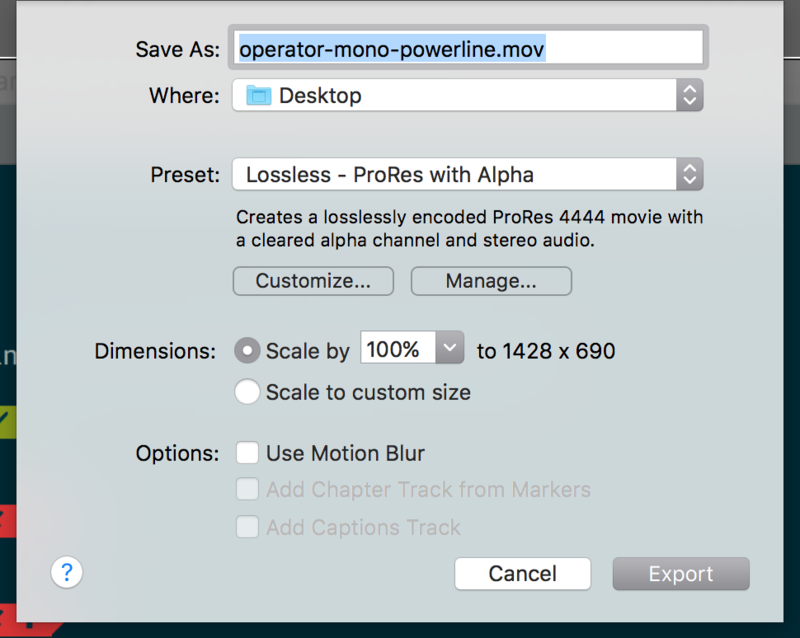 Using ScreenFlow, I export as Lossless. Yes, lossless. This is key as it gives you the highest quality video to convert to an animated GIF. Exporting to some kind of compressed video format will introduce artifacts that can not only make your final GIF look worse, they could make the final file size larger. Going lossless also gives you a huge file: 158MB for 19 seconds of video! Final note: I export the recording of my Retina screen at 1× rather than scaling it down to 0.5× so that I end up with the nicest looking GIF possible. Converting beautiful, high-res text to nasty, low-res text makes me sad. Max colors. No compression. High frame rate. Are those settings a little aggressive? Nope. The final product is a whopping 70KB. Surely I could squash that down some more, but this resulted in a final product that’s big and beautiful and certainly lightweight enough, IMHO2. 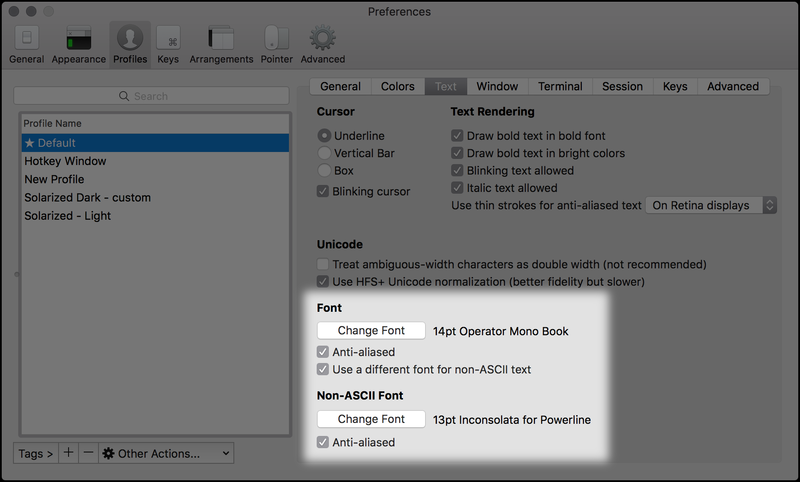 The trick is enabling the Use a different font for non-ASCII text option and then choosing a Powerline-compatible font. 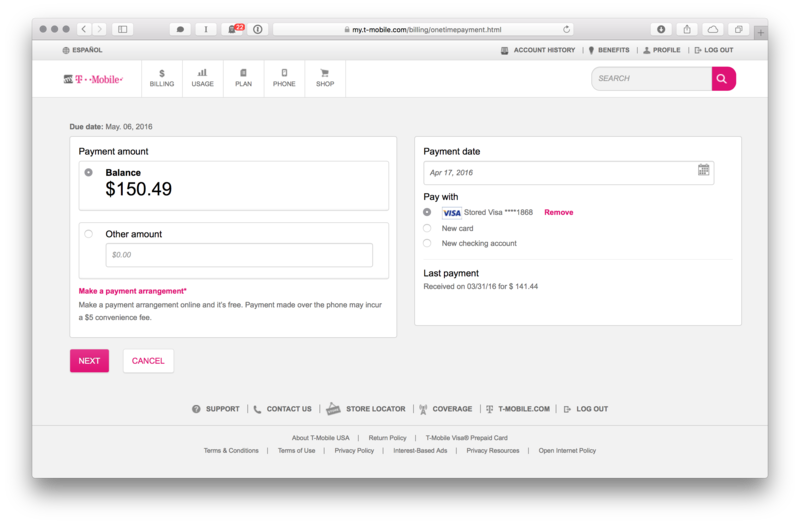 You’ll also have to strike a balance between the font sizes for Operator Mono and your Powerline font to make everything look nice. Getting the Powerline arrow characters to vertically align properly is the key issue here. The result of the settings I’m using can be seen below. After writing my first custom LaunchBar action the other day, I’ve been pondering the best way to work on LaunchBar actions in the future. 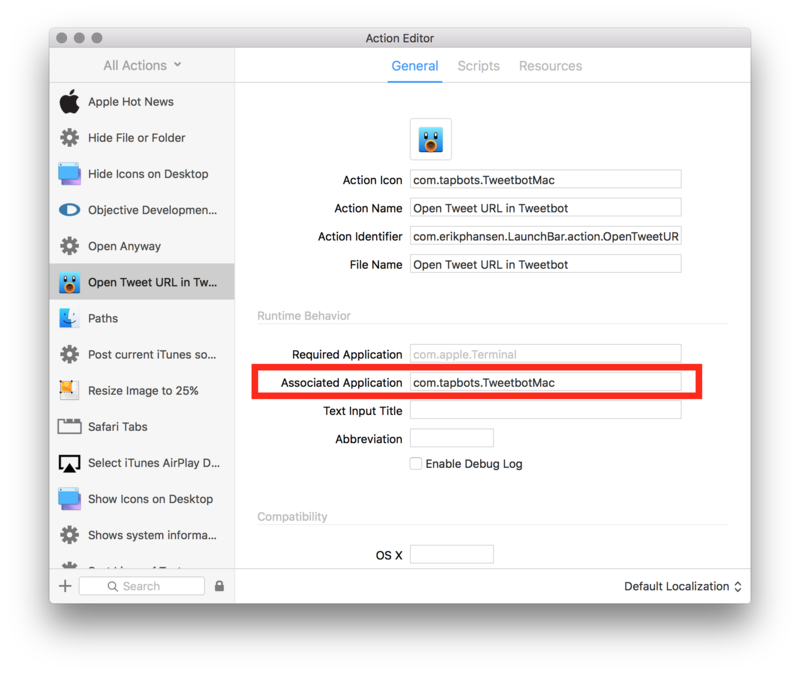 The biggest problem was that if you simply have your .lbaction sitting in the ~/Library/Application Support/LaunchBar/Actions/ folder, you can’t keep that action in a GitHub-friendly repo. Turns out that the solution to that problem is dead simple. You can put folders inside of the LaunchBar/Actions/ folder and LaunchBar will find the .lbactions in those folders, too. Problem solved! Never mind that I didn’t discover this until after I wrote a Node.js script that keeps two (or more) folders on your computer in sync in real-time. Sigh. It’s a long story. What follows is my real-time trouble-shooting of a Mac OS X problem I had two mornings ago. I was unable to find a solution online, but I did manage to get things back to normal. I’m posting this so that it might help someone else with a similar problem. Activity Monitor shows the ReportCrash process running and using ~10-11% CPU. It respawns after I kill it. Reboot doesn’t help. Everything is fine if I log in as another user. Seems that this issue started when I added a new folder of images (from Solid Color Backgrounds2) to the Desktop & Screen Saver preference pane. The folder was full of 1000+ tiny 1×1px PNGs. Or maybe it was the folder of 1000+ 640×480px JPEGs. The folder was added to the preference pane just fine, but trying to use one of those 1000+ images as the desktop wallpaper didn’t work. That seems to be what killed the Dock and made the desktop non-functional. I deleted the folder of images I had added to the preference pane. I removed both the reference to the folder in the Desktop & Screen Saver preference pane and I deleted the folder itself from Finder. Shortly after that, the desktop appeared and the Dock came back. I really went off the rails with this one. The morning started with experimenting in Keynote to see if it had the tools I needed to make some animations for a video project I’m putting together. Before too long I discovered a bug with the Magic Move feature when applied to two text slides. Looking for a solution led me to this old tweet from Jake Wharton. The tweet didn’t offer a solution, but it was nice to see that he ran into the exact same problem I had. After I came up with a hacky fix, I wanted to ask Jake if he ever found a good solution. Finally, the meat of this post! No way I was going to use the Twitter website to post my reply to Jake’s tweet. I’ll do it in Tweetbot for Mac, thank you very much. But how to open this specific tweet ID in Tweetbot? There doesn’t seem to be a way to punch a Tweet ID into Tweetbot. 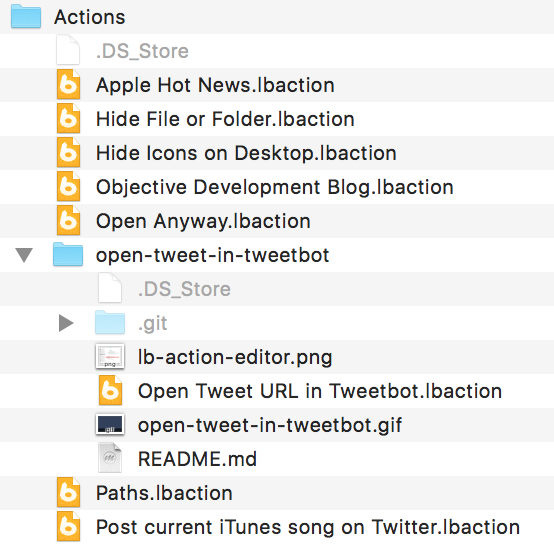 But there is a Tweetbot URL scheme that will accomplish the goal. All I had to do was replace the https://twitter.com/ portion of the tweet’s URL with tweetbot:// and that tweet would open up in Tweetbot. Brilliant! 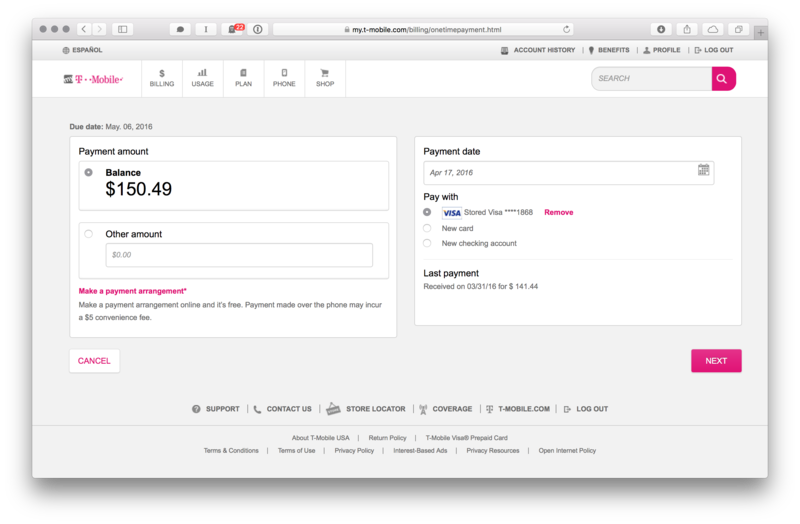 Turns out, once you dig into the LaunchBar Action docs a bit, it is pretty simple. So let’s walk through it. That’s all there is to it. A little regular expression magic and knowing how to tell LaunchBar to show alerts and open URLs is all this takes. This is far from a robust script. If you pass it a valid URL to a specific tweet in Twitter, such as https://twitter.com/eirkeirkeirk/status/725185945465556992, it’ll work. But it’ll choke and silently fail with a lot of other types of twitter.com URLs. So you can grab the .lbaction package from there instead of building it yourself. I made a tweaked version of the Solarized Light .tmTheme and posted it to GitHub. You can think of it as Solarized Light, with a tasteful sprinkling of italics and a few enhancements when editing Markdown. I always come back to using Solarized Light in my editor. When I use a darker theme, it’s usually Cobalt2 by Wes Bos. I really like how Wes uses italics in his theme and I wanted the same kind of thing in Solarized Light. This is my attempt at it. It’s working for me. Perhaps you’ll like it, too. Give it a shot. It’s almost like they dropped the same photo of Mike Mykytok into two different scenes. I went down the Google rabbit hole and ended up looking at the list of past U.S. 10,000m champions. The name Mike Mykytok jumped out at me. It’s a name I hadn’t heard or seen since 1997 yet it was instantly familiar. I’m not sure why. 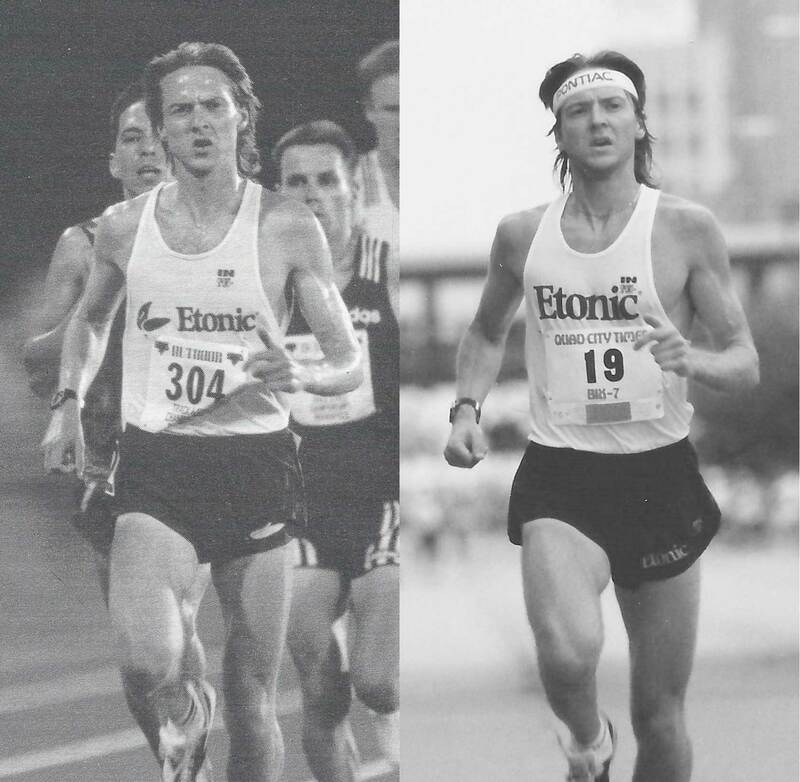 My best guess is that I was paying very close attention to the U.S. 10,000m scene in 1997. That’s the year I ran the race at the Junior National meet. Or maybe I saw him run a good 10K at Stanford around that time. Or because he was a former Junior National champ at 10,000m and for nearly two years of high school and college I was focused on doing the same thing. Who knows. Point is, running forms are like finger prints, aren’t they? The NEXT button is in the wrong place. By being on the far left of the screen, it implies BACK while its label reads NEXT. Cognitive dissonance makes me sad. Move the NEXT button to the far right, and make the button a little bit bigger while we’re at it. Buttons that move you forward within a process should be on the right, at least when dealing with languages that read left to right. Buttons that cancel the process or move you backwards should be on the left. 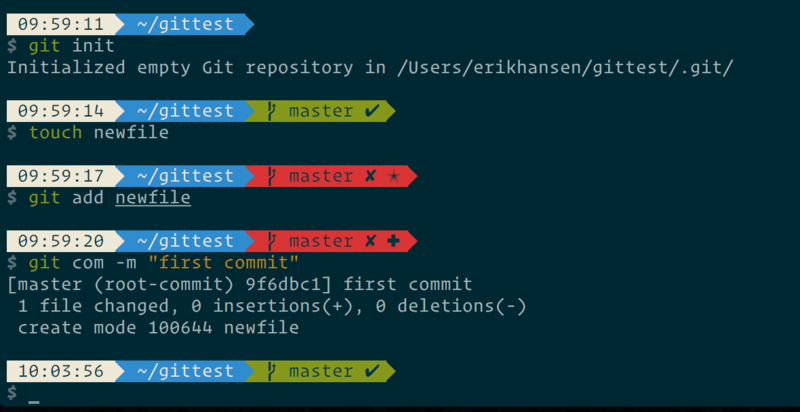 A few months back I wrote a fairly simple Swift command line app in Xcode. The app did some Core Graphics drawing and saved the results to a PDF in the user’s Documents directory. The project consisted of a single main.swift file. Running it from with Xcode worked great. The PDF was created and saved to disk. Even though I’m running this on OS X 10.11 and even though this runs just fine from within Xcode, it’s complaining that I’m trying to use a bit of API that might not be available. This allows the file to be run from the command line, but then Xcode flags that line with a warning: Unnecessary check for 'OSX'; minimum deployment target ensures guard will always be true. Yes, my Xcode project requires at least OS X 10.11, so Xcode is pointing out that I don’t need this check because we are guaranteed to always be running at OS 10.11. That’s a little annoying and I’m sure there’s a project setting to silence this kind of warning. But I’m not a big fan of silencing warnings. So this is an imperfect solution. And with that, it works great at the command line, but I get another one of those warning from Xcode telling me that I’m doing an unnecessary #available check. Safari can’t open the page “localhost:8888” because Safari can’t find the server “localhost”. It works just fine in Chrome and Firefox. And I swear this worked a few months ago in Safari. I can get Safari to connect to MAMP using 127.0.0.1:8888 or lapalapa.local:8888 (lapalapa is my Computer Name as set in System Preferences > Sharing). But that workaround isn’t ideal. I would really like localhost:8888 to just work as it should so that my local install of a WordPress site I’m working on loads in Safari. Are you f’ing kidding me? Restarting my Mac fixed it. I wonder if just killing Safari would have fixed it.